A few years ago, when Ziad Doueiri was staying in the Monot district of Beirut, he got into an argument with a construction worker over a leaky pipe on his balcony. 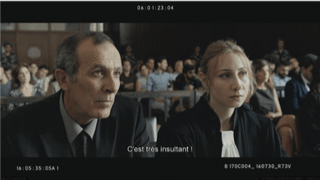 The matter was resolved quickly, but the filmmaker and his co-writer Joelle Touma began to think about what other possible scenarios could have emerged from the scene. This year, The Insult was released—a fictitious story that starts with an argument between two men over a leaky balcony pipe, and blows out of proportion into a national scandal that reeks of civil war. Almost 20 years after the release of West Beirut, Doueiri’s first feature film about the Lebanese Civil War that is widely considered a masterpiece, The Insult is about the quest for justice and dignity, and the rigidity of our personal and political beliefs. Set in modern-day Beirut, the drama sees Tony (played by Adel Karam), a car mechanic and die-hard Lebanese Forces supporter, go head-to-head against Yasser (played by Kamel El Basha), a Palestinian refugee working in the neighborhood. After a verbal insult, one thing leads to another, and the situation escalates into a court case that grips and divides Lebanon. Showing both sides of the story in a tense courtroom setting, it’s ultimately a human narrative of grief, anger, and hope. The film takes an insightful look at the troubled state of Lebanese society, exposing old wounds—personal and national—with finesse and sensitivity, while attempting to reconcile Lebanon’s collective trauma. 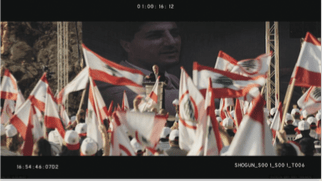 Most agree there has been no national reconciliation, and Lebanon doesn’t have an official written history of the conflict that ended in 1990—so it’s no surprise the film was met with mixed reactions. 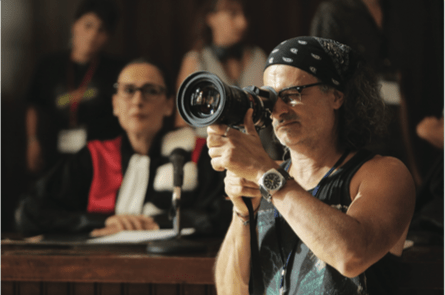 Perhaps because it hits so very close to home, some have criticized the director, who was arrested at Beirut airport last month and put in front of a military tribunal from which he was quickly released without charges. These critics ostensibly confronted Doueiri about his 2012 film The Attack, which was partially filmed in Israel, with Israeli actors, breaking a Lebanese law that bans it citizens from visiting Israel or having business dealings with Israelis. Doueiri, however, claims the real reason he has come under fire now is that these people are unhappy with the themes in The Insult. The loaded story was bound to start conversations and conflicts, but Doueiri didn’t expect such a harsh reception. To him, those who oppose The Insult are victims of their own blindness, the way many people are as a result of the war—including himself. As a teenager growing up in West Beirut during the Lebanese Civil War, Doueiri says he was instilled with ideas of division and unfairness, and admits he thought “the other side” didn’t suffer as much as his side did. “We looked at the [Christians, thinking] they never suffered … These are narratives of war, this is the misconception of war that has happened throughout history. He explains, “I grew up thinking there’s one perspective, which is my perspective … It might sound naive, but when you’re young you are naive.” Doueiri says it took him years to see other points of view and to change his own. “With time you grow, you start interacting with this ‘enemy,’ and you start to understand that the suffering was on both sides … It’s not easy to abandon beliefs,” he says, concluding that critics of The Insult have not yet come to the same understanding. “The people who are attacking us are actually victims because there has been no national reconciliation. They think that certain pain that happened during the war is exclusive to a certain group and don’t want to accept that there’s another side,” he says. Though it deals with a situation that is very specific to this country, and the Lebanese are more likely to relate to and understand cultural references within the dialogue, the film—which is in Arabic—humanizes politics and tells a universal story that transcends language and culture. The Insult won over the international audience at one of the most prestigious cinema events in the world this year, the Venice Film Festival, where it received a five-minute standing ovation and Palestine’s Kamal El Bacha won Best Actor for his role—incredibly, as this is the first feature film for the veteran theater performer. The movie has also been submitted to The Oscars, representing Lebanon in the foreign language category. Quality films are the key to building a national cinema industry, and international attention and awards are definitely helpful in developing the reputation of Lebanese cinema. Doueiri calls the local film industry embryonic, but believes it has a lot of potential, as long as filmmakers find ways to branch out to other markets—the Lebanese market is too small to carry the costs of a feature film production, let alone make a profit. Doueiri calls on more individuals to fund Lebanese films and offers various ways to lighten the load on investors, such as co-productions with other countries. What Lebanon really needs, he says, is support from the state—a film industry is a machine that needs everything from script writing, casting and directing, to post production, as well as laws that protect the industry and help with financing. Yet, he says the best way to elevate the Lebanese film industry is to focus on making quality films. “We have stories to tell, we have incredible talent and people that are dying to make quality movies,” the director says, adding that those stories can, and should, be Lebanon specific, as long as they are well-told. Authors are encouraged to write what they know, and that’s exactly what Doueiri advises filmmakers to do. 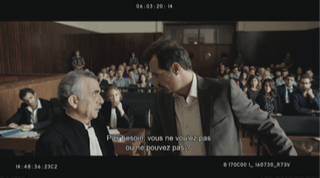 The Insult was inspired by a seemingly insignificant real-life plumbing incident that was fleshed out with the prejudices of individuals that have not healed from a cross-border tragedy. The Lebanese experience is a narrative rich with stories to tell, and with the right support, our film industry can bring these experiences to a wider audience.